While there might be a few youngsters out there who still believe every gift they receive was made in Santa’s workshop, high-quality, long-lasting toys are made possible by committed manufacturers working with the best components. High-tech gadgets may rate highly on many people’s lists, but a multitude of sought-after toys and games still employ basic mechanical devices such as bearings. These gifts require bearings to run smoothly and safely, as well as to help provide maximum levels of enjoyment throughout their lifetimes. Toys such as radio-controlled cars, yo-yos, skateboards, tops, scooters, roller skates, and jump ropes all rely on bearings for their overall functionality. The same types of bearings that are so important for industrial applications also play a vital role in the design and structure of toys. Whether steel, ceramic, 7mm, 8mm, or 608 bearings, many gifts would never function at all without bearings. 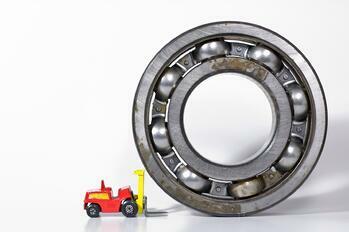 Sealed ball bearings of all different sizes are vital for remote-controlled cars. They allow operators to steer cars freely and for engines to work at high speeds. Another toy that utilizes bearings for high performance is the yo-yo; ball bearings reduce friction while a yo-yo spins at the end of the string. Enthusiasts have used yo-yos with steel bearings for decades, but for even better performance and corrosion prevention, some yo-yos are made with ceramic, instead of steel, bearings. There are other toys that use ball bearings, as well; ones that you wouldn’t necessarily expect to need them. For instance, many spinning tops utilize independent ball bearings to help them spin on any surface. Even top-of-the-line jump ropes have ball bearings — they often use precision and swivel ball bearings that eliminate friction and maximize the rotation speed of the rope. Why settle for walking when you can skate? Any toy with wheels will need bearings for functional, safe, and efficient operation. Skateboards rely on 608 standard bearings to eliminate friction between the metal in each wheel and the axle it spins around. The scooter, a popular toy, is evolving into a serious mode of transportation. Both sealed and shielded bearings are used to provide maximum protection during outdoor use. Roller skating, one of the oldest recreational pastimes, would be impossible without bearings — two bearings are used per wheel to allow it to move freely. Whether used for toys and gifts or major industrial applications, bearings play an important role in applications across the board. No matter what your next bearing project, the experts at Emerson will be able to help you find the exact product to suit your unique requirements. We offer a full array of informational tools and some of the most experienced personnel in the industry, ready to assist you. To find out more or to receive a quote, contact us today.